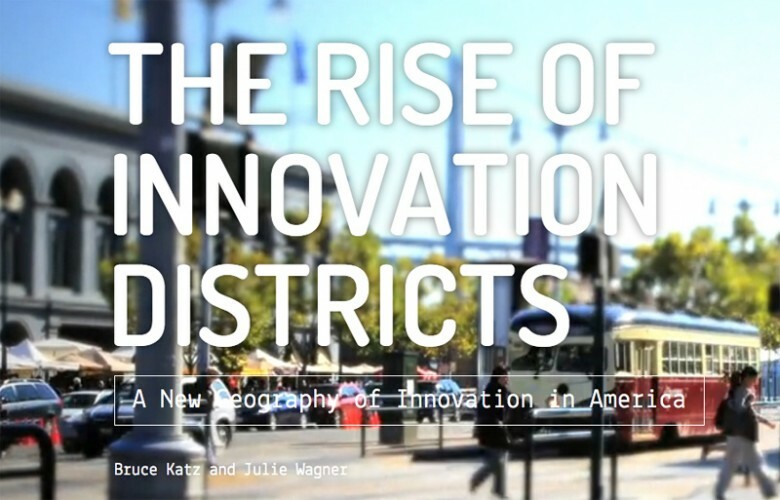 On June 9, the Metropolitan Policy Program at the Brookings Institution released “The Rise of Innovation Districts,” a new report analyzing this trend by Brookings Vice President Bruce Katz and Nonresident Senior Fellow Julie Wagner. Led by an eclectic group of institutions and leaders, innovation districts are emerging in dozens of cities and metropolitan areas in the United States and abroad and already reflect distinctive typologies and levels of formal planning. Globally, Barcelona, Berlin, London, Medellin, Montreal, Seoul, Stockholm and Toronto contain examples of evolving districts. In the United States, districts are emerging near anchor institutions in the downtowns and midtowns of cities like Atlanta, Baltimore, Buffalo, Cambridge, Cleveland, Detroit, Houston, Philadelphia, Pittsburgh, St. Louis and San Diego. They are developing in Boston, Brooklyn, Chicago, Portland, Providence, San Francisco and Seattle where underutilized areas (particularly older industrial areas) are being re-imagined and remade. Still others are taking shape in the transformation of traditional exurban science parks like Research Triangle Park in Raleigh-Durham, which are scrambling to keep pace with the preference of their workers and firms for more urbanized, vibrant environments. Innovation districts have the unique potential to spur productive, inclusive and sustainable economic development. At a time of sluggish growth, they provide a strong foundation for the creation and expansion of firms and jobs by helping companies, entrepreneurs, universities, researchers and investors—across sectors and disciplines—co-invent and co-produce new discoveries for the market. At a time of rising social inequality, they offer the prospect of expanding employment and educational opportunities for disadvantaged populations given that many districts are close to low- and moderate-income neighborhoods. And, at a time of inefficient land use, extensive sprawl and continued environmental degradation, they present the potential for denser residential and employment patterns, the leveraging of mass transit, and the repopulation of urban cores. Read the full report here, and join Catalyzing Newport on November 10th, 2014 for a webinar with Bruce Katz and selected leaders and government officials from across Rhode Island.